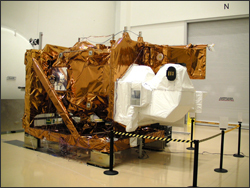 Nov. 26, 2012 • On Nov. 23, 2012, the Landsat Data Continuity Mission (LDCM) satellite concluded environmental testing in a thermal vacuum chamber at the Orbital Sciences Corporation’s facility in Gilbert, Ariz.
During the test all of the air was removed from the large chamber, creating a vacuum, and then temperatures within the chamber were heated and cooled to simulate the satellite’s expected outer space environment. Environmental testing of the satellite lasted 34 days and completion of the thermal vacuum tests marks the end of LDCM environmental testing. Engineers are now preparing the satellite for shipment to the launch site at Vandenberg Air Force Base in California. Once there, LDCM will be mounted on top of a United Launch Alliance Atlas V rocket, which is currently stacked on the launch pad. The launch is scheduled for Feb. 11, 2013.